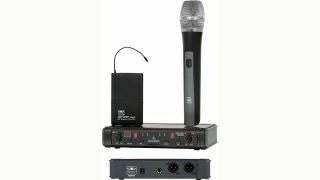 The What: The EDX Series is a dual channel, frequency agile wireless microphone system with a 200-foot range. The What Else: The EDX features 16 selectable UHF channels on each receiver, IR Sync from transmitters to the receiver and two internal antennas (one for each receiver). The receiver has one 0.25-inch output and two discrete XLRM outputs on the back of the receiver. The output is controlled by a volume control for each receiver, located on the front of the unit, along with AF/RF and channel indicators. Choice of transmitters include the HH38 handheld mic and the MBP38 body pack transmitter with choice of headset microphone or lavalier. The Bottom Line: The EDX Series is currently shipping with MSRP starting at $199, including the choice of two transmitters.